CHICAGO – 2010’s “Clash of the Titans” was a surprising box office smash, making almost $500 million worldwide. That kind of money demands a sequel, but what to call it? “Clash of the Titans 2” wouldn’t be exciting enough but it should sound similar. How about “Smash of the Titans”? “Flash of the Titans”? “Bash of the Titans”? They ultimately settled on “Wrath of the Titans,” although “Trash of the Titans” or “Crap of the Titans” would have been more accurate. This joyless, lifeless sequel is so routine and so boring that my mind wandered to the title decision mentioned above purely as a way to keep myself entertained. This is filmmaking without personality, a movie that doesn’t just feel like watching someone else play a video game but like it was actually made by a computer program. The veterans of the piece – Bill Nighy, Liam Neeson, & Ralph Fiennes – find a way to chew their scenery in an effective enough manner that they capture some of the B-movie charm of which the entire piece needed a LOT more, and the gorgeous Rosamund Pike has screen presence (even if she’s given nothing to do with it), but Sam Worthington gives another boring lead turn and the script is as generic and thin as fan fiction. 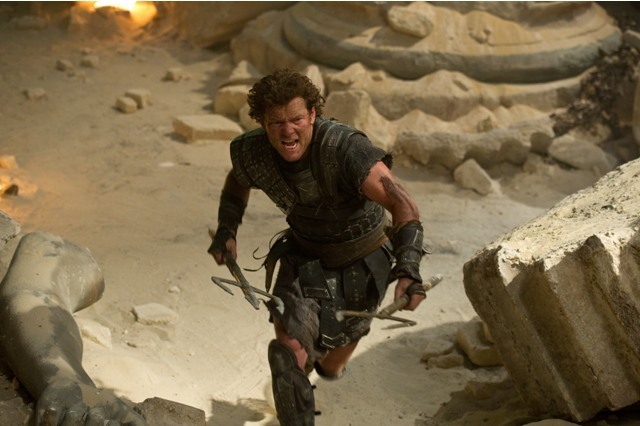 Read Brian Tallerico’s full review of “Wrath of the Titans” in our reviews section. Half-God Perseus (Worthington) has turned his back on the Gods yet again and chosen to live a humble life with his son when his father Zeus (Neeson) comes to him and asks him to join the fight against Hades (Fiennes), who is trying to unleash the legendary Kronos on poor Earth. Our sullen hero refuses and Zeus and brother Poseidon (Danny Huston) are soon kidnapped by Hades and turncoat Ares (Edgar Ramirez). The God of the Sea is killed and Zeus is held captive as his power is slowly drained to fuel the release of Kronos. Before Poseidon dies, he finds a way to reach Perseus and tell him that he has to find his son, Agenor (Toby Kebbell), as only the two half-Gods can save the world. Before you know it, Perseus and Agenor are tracking down the creator (Bill Nighy) of Godly weapons that, when united, can stop Kronos from destroying the Earth. On the way to battle, they join forces with the lovely Andromeda (Rosamund Pike). Continue reading for Brian Tallerico’s full “Wrath of the Titans” review. “Wrath of the Titans” stars Sam Worthington, Toby Kebbell, Rosamund Pike, Ralph Fiennes, Liam Neeson, Danny Huston, and Bill Nighy. It was directed by Jonathan Liebesman. It is rated PG-13 and will be released on March 30th, 2012.